Options: 14 lb. 5 lb. As the sun rises over the Savanna, felines begin their daily hunt for food. Cats have always preyed on protein sources as part of their wild, ancestral diet. 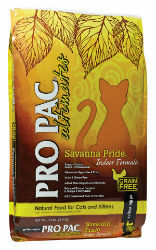 PRO PAC® Ultimates™ Savanna Pride™ brings that same thrill of the hunt to indoor cats and kittens today. High in fiber, Savanna Pride™ helps meet the unique needs of indoor cats by aiding in the control of hairballs. Your cat will love the hearty grain-free chicken meal formula which provides the ultimate in feline nutrition. PRO PAC® Ultimates™ Savanna Pride™ uses premium chicken meal as a high-quality primary protein source to help build and maintain strong muscles and a healthy shiny coat. This antioxidant formula is fortified with Vitamin E and Vitamin C along with nutrient-rich natural vegetables and fruits like peas, chickpeas, apples, blueberries, carrots, spinach and cranberries which help support good digestion and intestinal health. PRO PAC® Ultimates™ Savanna Pride™ is nutritionally balanced and fortified with proper levels of Omega-6 and Omega-3 fatty acids to help support healthy skin and coat. Balanced levels of calcium and phosphorus help build strong bones and teeth. A standard 8 oz. measuring cup holds approximately 4.8 ounces of PRO PAC® Ultimates™ Savanna Pride™. Chicken Meal, Peas, Chicken Fat (Preserved with Mixed Tocopherols), Chickpeas, Tapioca, Dried Beet Pulp, Whitefish Meal, Powdered Cellulose, Pea Protein, Natural Flavors, Flaxseed, Dried Egg Product, Apples, Blueberries, Carrots, Spinach, Cranberries, Potassium Chloride, Choline Chloride, Taurine, DL-Methionine, L-Lysine, Calcium Sulfate, Beta-Carotene, L-Carnitine, Vitamin A Supplement, Vitamin D3 Supplement, Vitamin E Supplement, Zinc Sulfate, Niacin, Ferrous Sulfate, L-Ascorbyl-2-Polyphosphate (Source of Vitamin C), Calcium Pantothenate, Thiamine Mononitrate, Copper Sulfate, Riboflavin Supplement, Pyridoxine Hydrochloride, Manganese Sulfate, Zinc Proteinate, Folic Acid, Calcium Iodate, Manganese Proteinate, Copper Proteinate, Biotin, Sodium Selenite, Cobalt Carbonate, Vitamin B12 Supplement, Yucca Schidigera Extract, Rosemary Extract.